In the US, the 2015 hurricane season begins against a backdrop of other recent extreme weather news. Texas floods and Midwest tornadoes remind us of what water and wind can do. We can take comfort from considerable improvement in hurricane forecast accuracy in recent years. But when a hurricane is gathering strength offshore, people in its possible line of fire still need to decide whether or not to evacuate to safer ground. As a social scientist, I've been interested in what goes into the choice whether to stay or to go, and whether people will have time to leave if that's what they choose to do. It's a complex decision that can be a matter of life and death. Why do some people evacuate and some do not? We're finding that timing can have a lot to do with it. Consider the comparison of lives lost due to Hurricanes Katrina and Sandy. Forty-one people drowned from Sandy's storm surge and 31 others died from falling trees and other causes. Katrina killed more than 1,800 people. Over half of the Mississippi evacuation zone residents headed the call and left ahead of Katrina. That compares with about 30% for Sandy, according to my own survey research. Comparing populations between coastal Mississippi and New Jersey/New York, a storm like Katrina could have translated to many thousands of deaths if it had hit the New York metropolitan area. It wasn't evacuation that made a difference in the number of lives saved. The sobering conclusion is that it was just luck that Sandy, hitting a much more populous area, had weaker winds blowing over people trying to evacuate the day the storm arrived. But the next storm through could have much more intense winds. 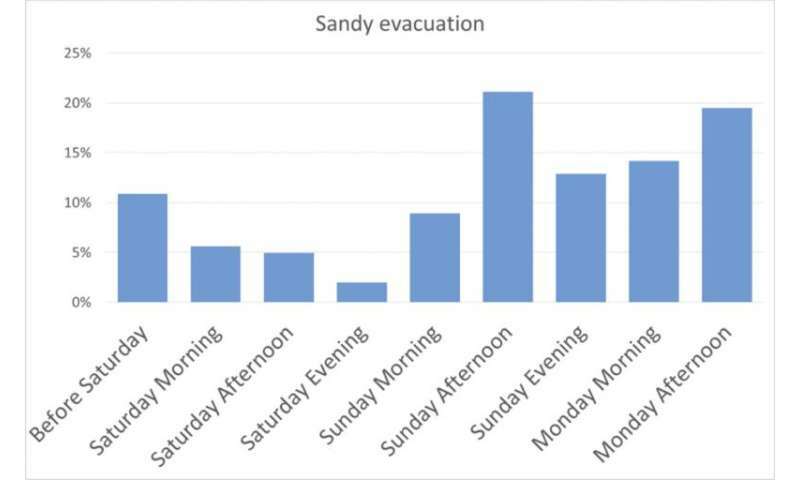 That potential scenario makes it crucial to examine why there was such a low evacuation rate for Sandy – and how to make sure a future situation would have a higher one. 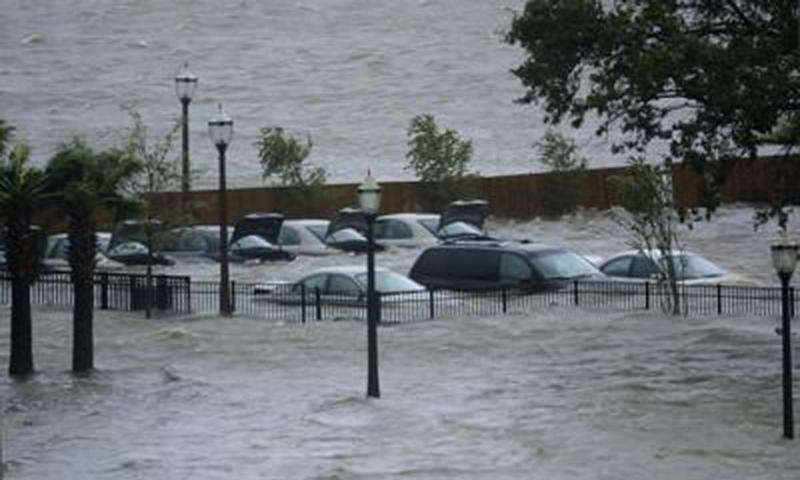 Most behavioral studies show hurricane evacuation rates can be explained by a number of factors, including media communication of forecast risk, physical risk at a person's location, demographics (for instance, people with young children are more likely to evacuate, while the elderly often find it harder to do so), and availability of transportation resources, as well as a place to go. However these factors never explain more than half the variance in evacuation. The rest is the hard part, what psychologist Paul Slovic calls "intuitive risk judgments." Certainly there are some people who believe they'll be safe no matter what. But most people routinely do a good job of deciding to do things like buying insurance against big dangers that are not very likely to happen. The problem for the public in hurricane evacuation is not the probability part; it's the danger part, whether storm surge could actually happen to me and result in my death or loss of livelihood. It's vital that everyone, politicians as well as the public, is educated about how storm surge works and the risks affiliated with it. When people aren't sure but get scared they will go ahead and evacuate, even when the result is unnecessary traffic gridlock, as happened in hurricanes Floyd and Rita. So the problem for forecasters, media and authorities is threefold: make sure the people at risk know they are, make sure people who can safely stay home know that, and get those two groups of people informed far enough ahead of time that they can know what to do when evacuation orders come down. 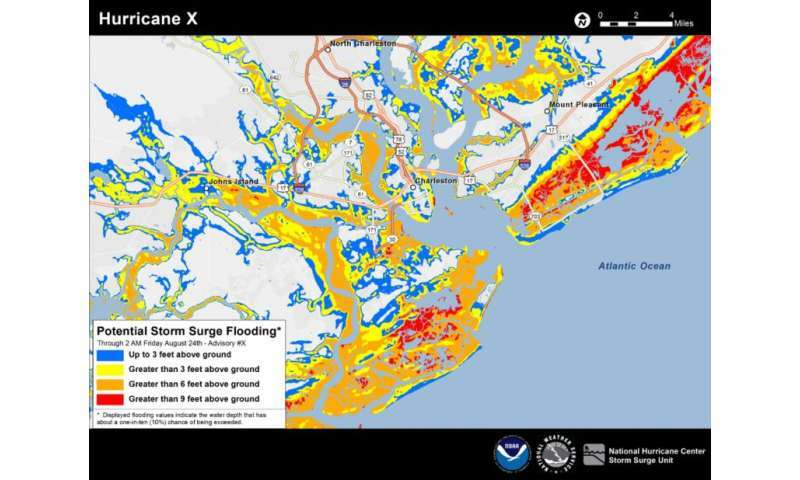 To accomplish these goals, precise locational information on surge risk is needed – such as will be provided by the new Potential Storm Surge Flooding Map developed by the National Hurricane Center. This kind of map can be made available up to 36 hours ahead of hurricane landfall once surge modelers know what the characteristics of the storm will be as it approaches land. Before that, an accurate forecast is not possible because location and height of storm surge is heavily dependent on the hurricane's track, size and strength, as well as the configuration of near-shore bays and other water bodies, and underwater terrain where it hits. Few studies have looked at what happens next, once people realize they need to evacuate. Timing appears to be a crucial factor. Studies indicate that authorities need to allow a full 24 hours after definitive evacuation orders for people to get ready and actually leave. Preparing to go, coordinating work and family members, and organizing transportation can take a full day. And after that, evacuees may need 10 hours of daylight to travel before hurricane force winds arrive. Hurricane Evacuation Studies are done by the US Army Corps of Engineers. These incorporate behavioral studies and traffic modeling to predict clearance times to get everyone out of evacuation zones, assuming good compliance with evacuation orders. Clearance times for the Miami area, for instance, run 20 to 30 hours, depending on the size of storm forecast. As noted above, this 24+10 hour time frame is approximately how far out hurricane forecasters can accurately predict where storm surge impact is likely to be. So in this case the limits of our forecasting technology fit with the limits of human preparation. The trouble comes in if the 10-hour period for travel turns out to be at night. Postponing departure until morning, which is human nature, means evacuating and traveling through tropical storm force or higher winds. Hurricanes Ivan and Sandy both fit this scenario, with people evacuating through tropical storm force winds. 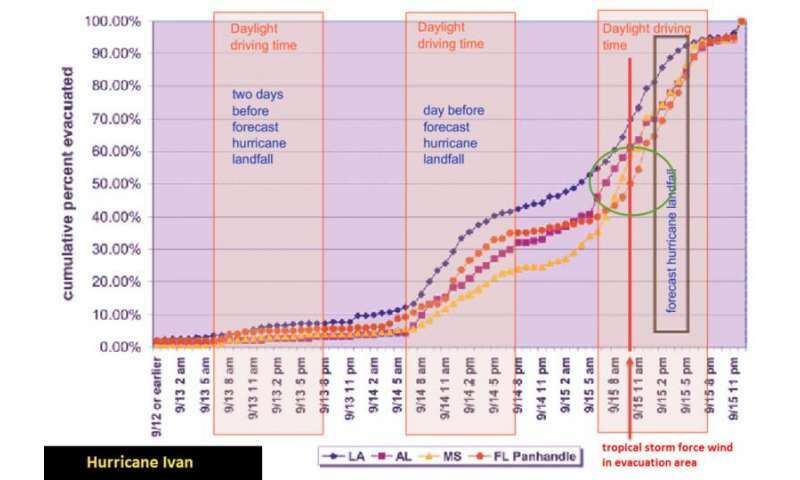 Hurricanes Katrina and Andrew did not, because their time frames were 12 hours different, allowing people to travel during daylight before the storms arrived in the early hours of the morning. The time potentially needed for evacuation thus makes it essential that the public knows what the worst case for storm surge could be for them and is alerted to the need to plan for a possible evacuation order. The National Hurricane Center has maps of worst-case storm surge scenarios for any configuration of possible hurricanes along the US coastline. Emergency managers use these routinely, but media and authorities need to communicate to the public where people must be alert to risk and also where people can know they will not have to evacuate in any hurricane scenario. Emergency managers are charged with ensuring the safety of the population. "Prepare for the worst" is probably a good philosophy in most circumstances, but not in the case of evacuation for a hurricane many days away, when the cost of mobilizing is high and the probability of it being needed is very low. The government and media also grapple with not wanting to be unnecessarily alarmist. The correct philosophy is "know what the worst case could be and be prepared to face it if it comes to pass." When an evacuation order is issued, it's usually in a very compressed time frame – but that's ok as long as people are prepared. If people plan three to five days ahead, knowing that there is a small but real chance they will be asked to evacuate and a small but real chance of death if they do not, they can be ready when the definitive order comes in.